The Farmer's Markets will be starting soon and the abundance that spring and summer have to offer will be in my grasp. Believe me I will be one of the firsts to welcome it in. In celebration of the good times to come, I bring you the Tomato Tart. These would be so wonderful at a bridal shower, a ladies luncheon, or as an appetizer for a cocktail party. Served with a small salad these are a perfect size for lunch. Wishing you all beautiful, warm spring days! I used one half of the recipe of Cheri's Favorite Pizza Dough. Preheat oven to 500°. While the oven is heating shape your dough into desired shape, I made 4" rounds. Poke several small holes in the crust with a fork to prevent bubbling. Brush pizza dough with extra-virgin olive oil. Transfer pizza dough to whatever, pan, stone, etc you will be using for cooking. Cook pizza dough for 7 minutes or until crust is golden. In a small mixing bowl combine first (3) ingredients. 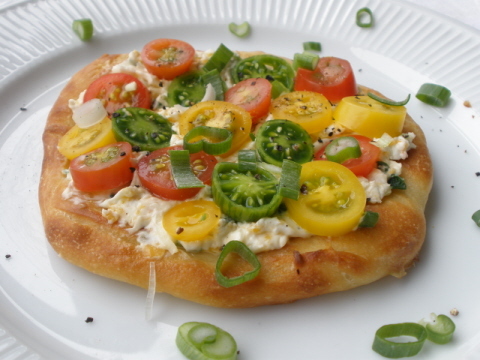 Spread cream cheese mixture over pizza dough after they have slightly cooled, and layer tomatoes over the top. Don't have your fill of pizza ideas? Get all 22 weeks worth here.